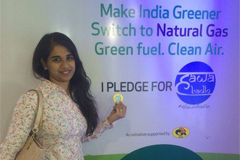 HAWA BADLO is an independent people’s movement spearheaded by Social Cloud Ventures aiming to change the air quality level with collective societal efforts. The initiative is supported by GAIL (INDIA) LIMITED. Hawa Badlo is social movement targeting the digital Indian with humorous, eye opening and factual stories and social experiments aimed at propagating sustainable mind-set change at individual level, which collectively establishes an extensive community change for greener and cleaner tomorrow for us and generations to come.